Teterboro, N.J.-based Dassault Falcon Jet–the wholly owned subsidiary of Dassault Aviation that is responsible for Falcon sales and service in the Americas, Pacific Rim and China–celebrated its 40th anniversary on Friday. 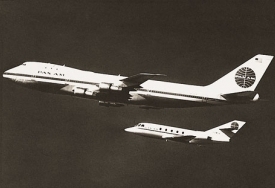 On Dec. 1, 1972, executives from Pan American Airways and Dassault Aviation signed an agreement to form what is now known as Dassault Falcon Jet to expand the U.S. market with Pan American, the launch customer for the Falcon 20. Known today as Dassault Falcon Jet, the Teterboro, N.J.-based Dassault Aviation subsidiary was founded 40 years ago as Pan American Business Jets. It originally was a partnership between Dassault and Pan Am to sell Falcon 20s in the U.S. Today, Dassault Falcon Jet is a wholly owned subsidiary of Dassault Aviation that sells and services Falcons in the Americas, Pacific Rim and China. Dassault Falcon Jet currently has about 3,000 employees scattered among its headquarters, completions and service centers and at subsidiaries in Florida, New Jersey and Beijing. To date, more than 2,200 Falcons have been delivered, about half of which are based in the U.S.